We don’t have a slow cooker, but the Dutch oven did the trick. Here was my first stab (of many!) at finding the perfect homemade tomato basil soup. This version is from Tiffany at Creme de la Crumb. 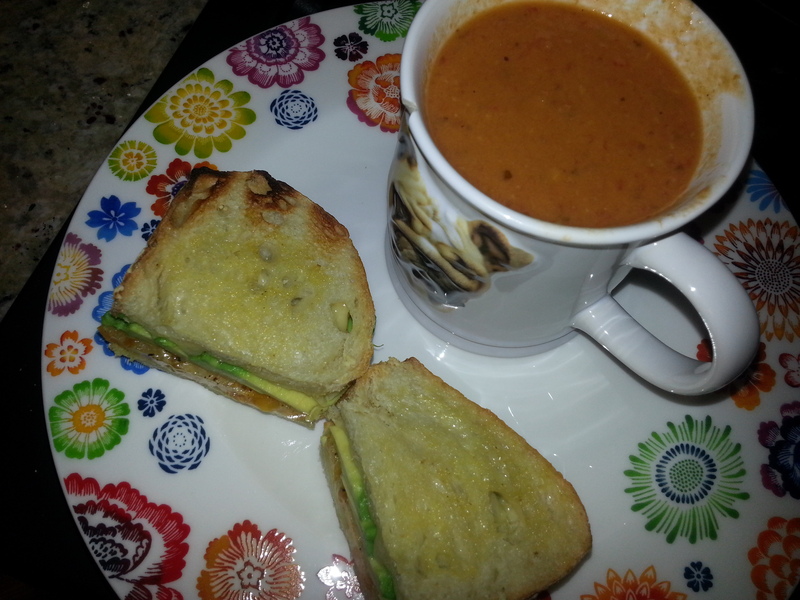 I think grilled cheese is always the perfect accompaniment to tomato soup, particularly on rustic bread with Vermont cheddar and avocado. Yum! About 30-40 minutes before serving transfer soup to a blender or food processor and puree until smooth, then return to crock pot. Prepare the roux. Begin by melting the butter in a medium sauce pan over medium heat. Add flour to melted butter and stir until flour clumps up. Slowly whisk in the heavy cream (or half & half) until mixture is thickened and smooth. Add roux and parmesan cheese to crockpot and stir to combine. Allow to cook another 20-30 minutes until cheese is completely melted. Give it a good stir before serving. Top with additional basil and parmesan cheese if desired.